We stayed at Casa Huerta for a relaxing and brief stay. The property was gorgeous and the town was adorable. Surfing was a bit of a drive away but we were able to find some great local spots. The dogs on the property were friendly and Pamela had a lot of good recommendations. My husband and I stayed at Casita Huerta for ten days while attending the wedding festivities of close California friends. The property is amazing, and we thoroughly enjoyed picking fresh oranges and avocados daily! The casita was perfect for the two of us, with the 4-floor to ceiling doors that open the main living space to the outdoors, a comfortable queen bed, a small but adequate kitchen, and gorgeous sunrise views from the large kitchen windows. The loft (which has a separate entrance, but is open to, and looks down on the casita living area) was ideal for our adult son who joined us for a few days. The photos and descriptions in the listing are accurate, and it really is just a 20 minute (albeit very dusty) walk into town. We made good use of the surfboards at nearby La Pastora beach. This is not a sterile tourist hotel, and you must expect some critters, but if you desire the real Mexico then it's a five star! Pam was helpful but unobtrusive. Her casa, although next door, is well screened by the beautiful tropical plantings and mature fruit trees. We had a lovely stay at Casa Huerta. The home is so beautifully designed with great attention to details. We arrived at night, and woke to the most light filled space imagined. Todos Santos was beautiful and friendly. We were lucky enough to meet one if my favorite painters along the way as all stars aligned perfectly. The trip was too short and we will for sure return ( soon , I hope ) and will absolutely stay at Casa Huerta again. Many thanks! My husband and I always look for the artistic place to stay, as far from the American hi-rise hotel concept as possible. This doesn't mean we don't want creature comforts, we just want them in a unique, atmospheric setting that reflects the culture we are visiting. 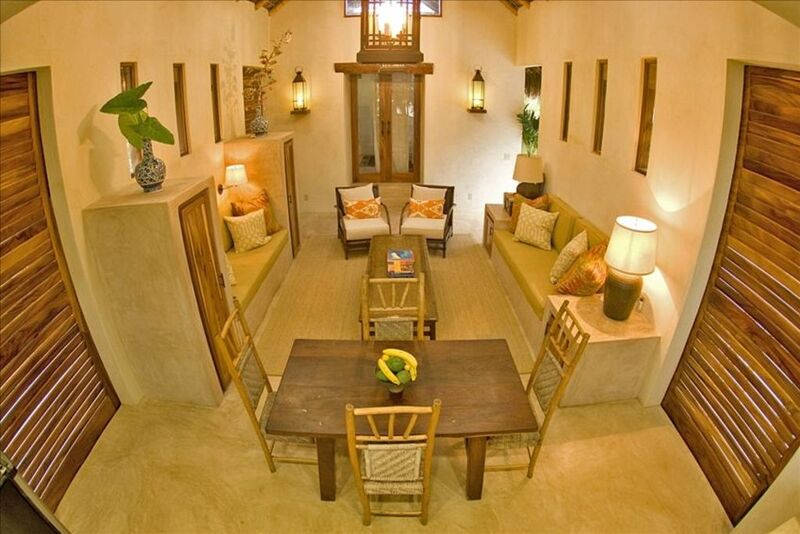 This casita is extremely comfortable, full of very thoughtful details, and every inch of it very beautifully conceived. The photos sold me, and yet, they do not do justice to the property. Baja was a midway spot to meet our adult daughter for a getaway, and the casita was perfect. The loft, with its separate entrance, afforded a private space for her, even though we were in the same house. There isn't enough room here to mention all the details that make the home so easy to relax in, but a few are pretty outstanding. There is a separate, really beautiful bathhouse. A door leads from the bedroom, down a couple of steps, into the bathhouse. A set of doors blocks this path from view of the patio, offering privacy en route. Another set of doors leads from the patio into the bathhouse. There are two built-in couches in the living room area, with thick, very comfy cushions, and a reading light at each end. Four huge sliding doors blur the line between indoors and outdoors when left open. A long row of pegs in the bathhouse allows for beach towels and suits to be hung to dry for the next day. A light illuminates the grill outdoors, and another lights up the eating area under the palapa. These may sound like small things to comment upon, but they add up to the feeling that the whole house has been laid out with an eye to what it is like to actually live there. I'm a nester, and when I travel, which I do a lot, I like to feel that for whatever amount of time I am staying, I am able to make the environment my own. And....I love to cook. The fact that the kitchen was well stocked, the appliances of top quality, and the grill easy to access, were important to me. Pam, the owner, lives on the property, though her home is camouflaged by lush plantings surrounding the patio. She knows the area, is very friendly, and very helpful. My husband was an interior designer for many years, and was blown away by the artistry with which she designed and furnished the casita. All in all, it couldn't have been a better experience. I'm tempted not to publish this review, for fear that if word gets out, it will be booked next time we want to visit! We stayed in the Casita and couldn't have asked for a better experience. The accommodations were comfortable, clean, and charming. The location was great- waking distance to everything including the beach and town center, but amongst a beautiful garden, creating a peaceful and private environment. The owner was great in answering all our questions, providing us with directions, and making sure we were comfortable. The owner was very friendly and helped us out when we needed it. The casita itself is among the trees, and although it's within 40 feet of the main casa you'd hardly know it. The parking area is separate and the gardens and fences do a great job of separating the two residences. It has a great private patio and you can open up the large sliding doors to make it largely open to the outside. We liked how you could hear the sounds of town, but not so loud as to keep you awake. It's a short walk or drive to the store, a great breakfast place and a bar at the Hotelito. You can also walk down to the beach. We were there in November and participated in one of the nightly baby turtle releases at sunset, which I highly recommend. We were told the releases happen nightly through at least the end of December. The kitchen is well stocked from an equipment perspective, although don't expect any spices or other basics. We even had to buy salt. We would definitely return to this lovely spot in Todos Santos!